Ola chief executive officer Bhavish Aggarwal recently posted his own picture at a sector event together with Flipkart co-founder Sachin Bansal and Paytm CEO Vijay Shekhar Sharma on Twitter. Aggarwal tweeted, “Good fun with Sachin Bansal, Vijay Shekhar. . . great audience,” which was promptly re-tweeted by the Flipkart chief. Most of these start-up stars follow each other on social media. Sachin Bansal, who has 31,900 followers on Twitter, follows 207 people, including Snapdeal co-founder Rohit Bansal, Zomato chief Deepinder Goyal, Paytm’s Sharma and Ola’s Aggarwal, among others. He also follows Chinese e-commerce major Alibaba, which has invested in rival firms Snapdeal and Paytm but not in Flipkart. In spite of such bonhomie on social media, every competitor is eyeing the top slot that Flipkart, which turned eight on Saturday, holds in Indian e-commerce. Snapdeal CEO Kunal Bahl had last week said his company would take Flipkart’s position by March 2016 in terms of gross merchandise volume of products sold. However, Paytm CEO Sharma thinks GMV is a frivolous number to chase. Paytm gets more orders than all the other e-commerce universe put together, Sharma said, indicating the mobile wallet service had already overtaken Flipkart in some ways. A recent report cited data from internet analytics firm Comscore to suggest Amazon India had 23.6 million unique visitors in May, compared to Flipkart’s 23.5 million. Incidentally, Amazon, where Sachin and Binny Bansal had started their career in the US before starting Flipkart in Bengaluru, is not in the list of 207 that Sachin follows. That doesn’t stop Flipkart and Amazon from talking to each other on social media. Recently, Reddit India, a portal, tweeted a photo showing an Amazon delivery box at Flipkart’s reception. “Even Flipkart orders from Amazon,” it said. To that, Flipkart retorted, “We recycled (the) said packaging as our reception’s dustbin.’’ Amazon tweeted back, “There’s a bit of Amazon in every e-commerce company,” perhaps implying Flipkart founders’ start at the US-based e-commerce company. Eight years after starting as an online book retailer and then turning into a marketplace player with focus on multiple categories, including electronics, mobiles, fashion and accessories, Flipkart is still in the red. However, the sector looks at the Bengaluru-based company as an entity that transformed Indian e-commerce. Sachin Bansal refused to speak to Business Standard for this story but many others this newspaper spoke to said the company had a defining role in making the sector what it is today. Paytm’s Sharma said, “Flipkart can be identified as the starter of e-commerce in India. Another competitor, Sandeep Aggarwal, who had founded e-commerce firm Shopclues, said: “At least four players, including eBay and Rediff, had been prominent players in the country before Flipkart. 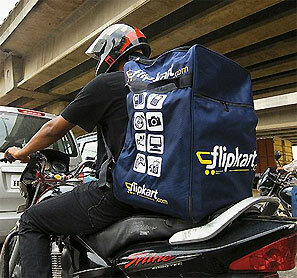 Flipkart, he said, understood the moment of truth in Indian e-commerce was fulfilment and shipment. And, that did it. Sectoral estimates suggest India took 15 years to touch revenue of $200 million in countrywide e-commerce in 2010-11. In the next four years, Indian e-commerce reached $5-6 billion. For this, a sectoral source gave credit to Flipkart for introducing cash on delivery as a concept. According to Mohit Bahl, partner, retail practice, KPMG, the entry of international majors such as Amazon, Alibaba and Softbank was to a large extent due to the role of Flipkart in Indian e-commerce. Flipkart, which had an estimated GMV of $4 billion in March 2015 and is aiming for $10 billion to $12 billion by March 2016, is valued at around $15 billion. Its closest competition Snapdeal had a run rate GMV of $4 billion in August 2015 and is readying to cross Flipkart sales by the end of this financial year. There’s no official data on market share, but an industry source says Flipkart’s market share has dipped slightly from 40 per cent in the past two years. Snapdeal is second at around 20 per cent share and Amazon India at 15-18 per cent in terms of value of sales, the source added. Rediff.com also has an e-commerce business which competes in some areas with Flipkart.